Purpose: To prohibit cyclists from using the carriageway, lane or path where they can cause a danger to themselves and to other road users. Action: Look out for cyclists who use the road despite the prohibition. 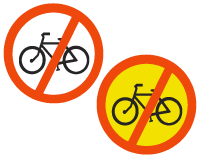 Cyclists must follow a different route and may not proceed beyond this sign.